Having more 20s themed parties and events to attend, together with a great vintage find of an old tuxedo jacket and pants, has entailed my working towards putting together everything necessary to historically suit up my hubby like a “white tie” gentleman from the Jazz Age. This post is “part 1” of what will more than likely be a total of three, maybe four, total increments to reach a complete 1920’s Tuxedo ensemble. The other parts will be the shirt (and collar), vest, and a cummerbund or even a bow tie. For now, I’m starting from the bottom up, with turn-of-the-century gentleman’s shoe spats. 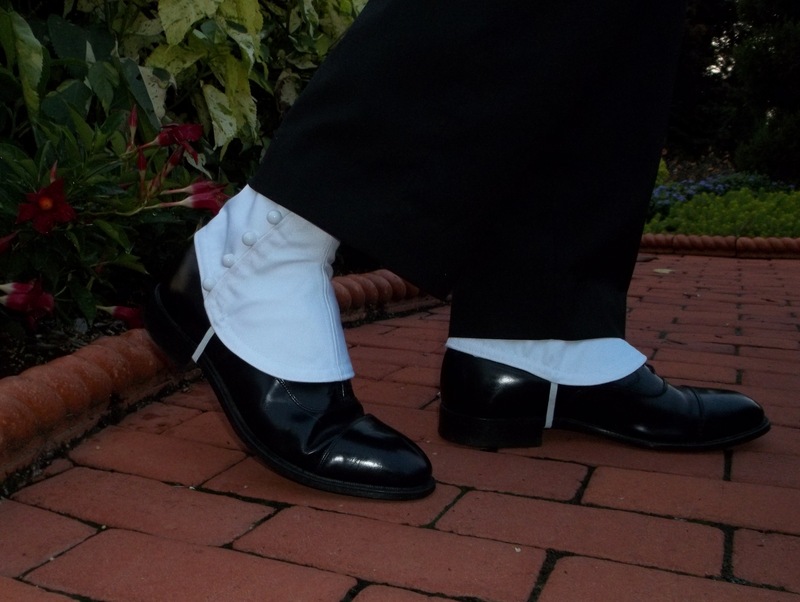 The spats I made for him turned out wonderful, look great, a fit very well. They were also fun and unusual to make. I love trying new things! It is a bit unfortunate that vintage menswear is so scarce. Thus, I’ve been turning to old and reproduction patterns as of late to clothe my hubby in something to match my own eras of vintage and historic clothing. However, even vintage and reproduction men’s patterns are not as plentiful as the choices for women, so I was extremely happy to find such a wide selection of historically authentic patterns for men through the company Reconstructing History. This company is a great resource, not just for patterns, but also for ideas and through historical information. 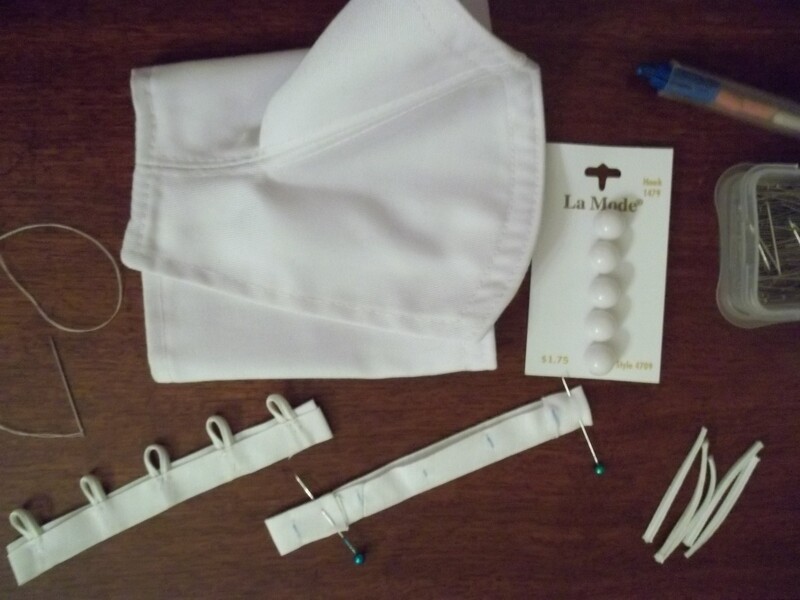 NOTIONS: two packs of big ball “La Mode” buttons were the only notion bought; the elastics and thread and bias tape were already on hand. TIME TO COMPLETE: The spats were very easy and quick coming together, they just took me a bit longer to sew because of the machine I was working on. I wanted to enjoy myself, get to know the sewing machine…more about this later. The spats were made by me in a total of 5 or 6 hours ( a few evenings worth of a little time), and finished on August 7, 2014. THE INSIDES: All seams are clean, mostly hidden, and oh-so-professional looking! I picked out the Reconstructing History downloadable 1900s gentleman’s spats pattern to make for my hubby. The downloadable option is great because not only do you save money, but most of all, you get your pattern almost immediately…no wait! The downloadable option was perfect because I needed the spats done for a party in less than two weeks. You simply print out the pages, then connect and tape the pages together for the full pattern, similar to Burda Style patterns (see my post here). Their pattern pieces included the seam allowance, and thus can either be traced out onto something else, or cut straight out of the paper. Being a relatively small pattern I just used the paper version. Any changes will just go on a paper note with the spats pattern so I can remember what I did for the next time these are made for hubby. This way if I need to make the spats for anyone else I haven’t changed the pattern itself. The spats pattern is only three simple pieces, with each getting cut out a total of four times if you are lining the spats, and twice each if your spats are not lined. Personally I would completely recommend lining the spats for a very nicely finished item that is sturdy and not droopy. A heavier duty fabric also seems to work well for spats as well. All three of the fabric pieces get sewn together in one, two-seamed, continuous semi-rectangle. 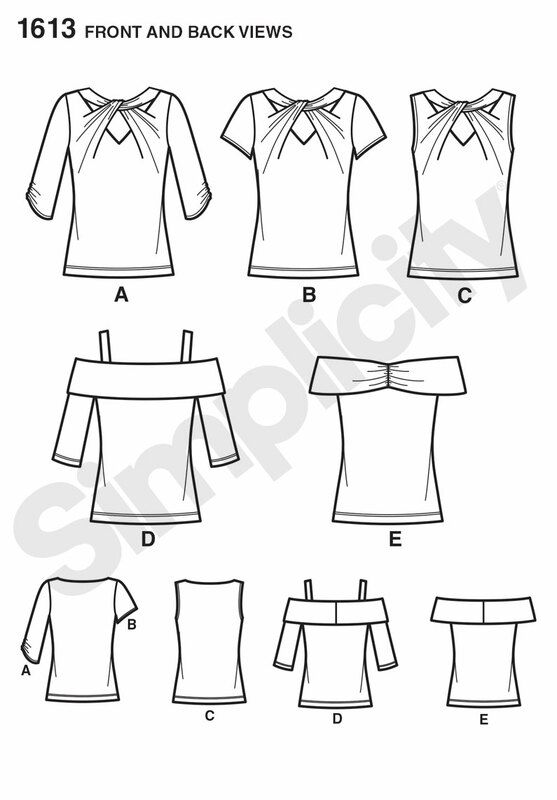 Thus, if you are lining the spats, you end up having four fabric pieces. As my hubby’s ankles are a bit skinny, I had to do a small adjustment on all four fabric pieces before connecting the front and lining together. I sewed in a tapering seam of about 1/4 to 1/2 inch from the center front corner seam over the calf to the top of the spats. Then, with wrong sides out, two of the spats semi-rectangles get sewn together at a time. I stitched all along three of the spats sides (right side, left side, and the top) and next turned right sides out. The raw edged bottom got white single fold bias tape sewn on and turned under. The entire sides and the two seams where the three pieces connected were top-stitched down through all layers. 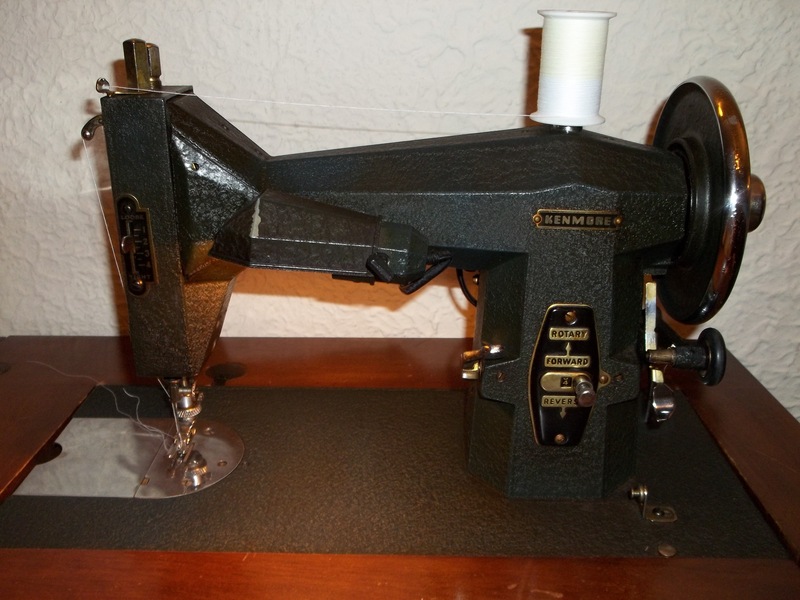 Everything up until now, had been sewn on my “new” birthday present – a late 1930’s Sears Kenmore Rotary sewing machine in impeccable condition, and in a beautiful table/cabinet as well! It was really fun to get a closer feel for how they did things back in the past, even though there is a decade of difference between the spats and the Kenmore. I can’t wait to sew more on this gem. My parents sure know in a good way what will make my special day…I was very surprised and tickled (especially with the giant bag of attachments and thread, some of them silk)! I went back to my heavy-duty, early 80s standby Singer sewing machine to make my own elastic loop closure strips for the edges of hubby’s spats. I didn’t want to do that many tiny button holes on the spats and make it hard for hubby to get them on himself. The pattern itself suggests elastic, and, besides, elastic was starting to become more prevalent in the 20s. Cutting small sections of cord elastic of about 1 1/2 inches, and marking equalized spaces out on a strip on double fold bias tape, I hand sewed my own “loop tape” to go along the sides of the spats. Hand sewing the “loop tape” was hard on my hands, but, with a thimble and some good music on for help, it actually went faster than I expected and the finished result was well worth the effort. I used my heavy duty Singer machine to sew on the “loop tape” along the very edge of the two spats’ left sides. Then I matched up the spots where the loops are on the spats’ right sides and sewed on buttons in their corresponding places. Last but not least came the strap that goes under the foot in front of the heel. The Reconstructing History pattern called for elastic and I used some small 1/4 in non-roll white elastic from my stash for the underfoot strap. After paging through my old reprints catalogs from the 1920’s and 1910’s, I suppose a true historical feature for these spats would have been to have the underfoot strap be more like a belt, with a tiny buckle to loosen and tighten the fit. However, I knew the strap would more than likely get quite dirty and take much more time that I didn’t have (not to mention where to find such a tiny buckle), so I opted for the easy “elastic” way. Hubby put the spats on so I could mark (while they were on him) where to sew the elastic underfoot straps on and how long to make them for a perfect fit. 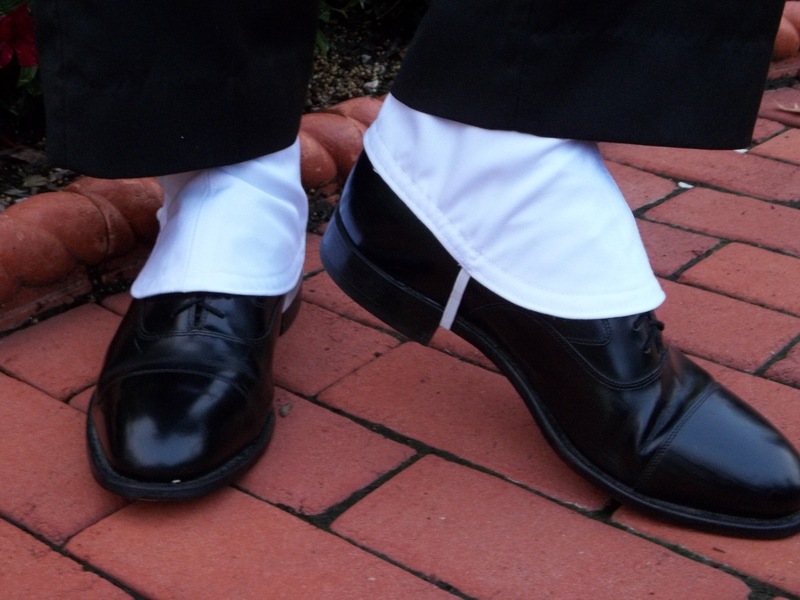 I am excited to see how the rest of the accessories for hubby’s tux look with these spats. The cotton twill of the spats are a wonderful match with the mid-weight grooved gabardine he picked out for the main body of his vest. Think of the actor Jean Dujardin in the movie “The Artist”; that will be my idea of hubby in his finished tux ensemble. He’ll be a “Dapper Dan” man! What do you do with your leftovers? Do you chuck ’em for fear of adding clutter and forgetting about what you have in the house? Maybe your leftovers get thrown off to the side with a half-hearted wish to make them useful sometime soon. Or perhaps you judiciously sort, file, or store any scraps for later use. Whichever category you fit in, and I’m sure there are more divisions to add, this post is meant to show what I did with some precious leftovers…of fabric, that is to say. I seem to fall in the last ‘leftover’ category which I mentioned, and I often impress myself at how I can find a use for every inch of my scraps. So, knowing how I save and use my scraps, you can imagine my excitement at creating something with the leftover pieces from my “Doris Day blouse” (winner of the “Butterick to the Big Screen” 150th Anniversary sewing contest). I was a bit disappointed in this top, merely because there were high expectations for it coming off of a great project. 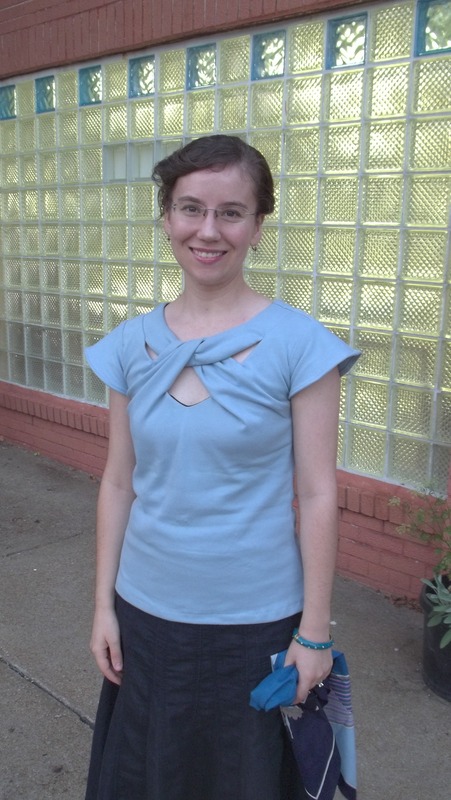 However, I do really like this top after wearing it, and find the construction and the vintage/modern details a winner! FIRST WORN: out to do errands (get my glasses fixed, stop at Walgreens, etc. ); big deal! I hope to wear it out to a few nicer occasions soon. THE INSIDES: Turned inside out, this top is has clean invisible seams, with a smooth on the skin and professional look – all thanks to the great pattern design. See ‘inside out’ picture below. The most important, number one piece of advise I can share about this top is…FOLLOW THE INSTRUCTIONS! I can’t stress this enough, and, coming from me (who almost always changes or adapts patterns), this statement should be taken seriously. Like I said before, the layout of the instruction sheet steps and the design of constructing the top are so very smart, giving the finished product an amazing finish to some amazing details. Reading through the instruction steps, and picturing in one’s head what you will be doing with your machine and the fabric helps immensely towards eliminating any confusion when actually putting this top together. Read the instructions again and again (like me), if you have to – some of the steps are tricky, but not hard. With a thorough knowledge of sewing skills and an unwillingness to be deterred, anyone should be able to sew up this showstopper top. Simplicity 1613 is the only modern pattern (so far) which has impressed me to this degree on many levels. 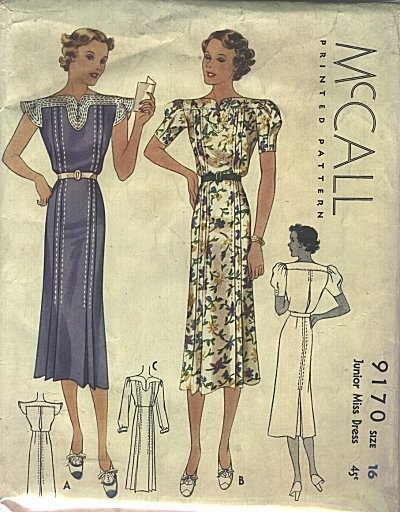 I wish more patterns had Simplicity 1613’s good features, especially the year 1935 Vintage Vogue #2859, which –click here to see my version– has many similar neckline features to this blue blouse. 1930’s goes modern very well! My only changes made to this twist neck top were minor, but nonetheless useful little points. 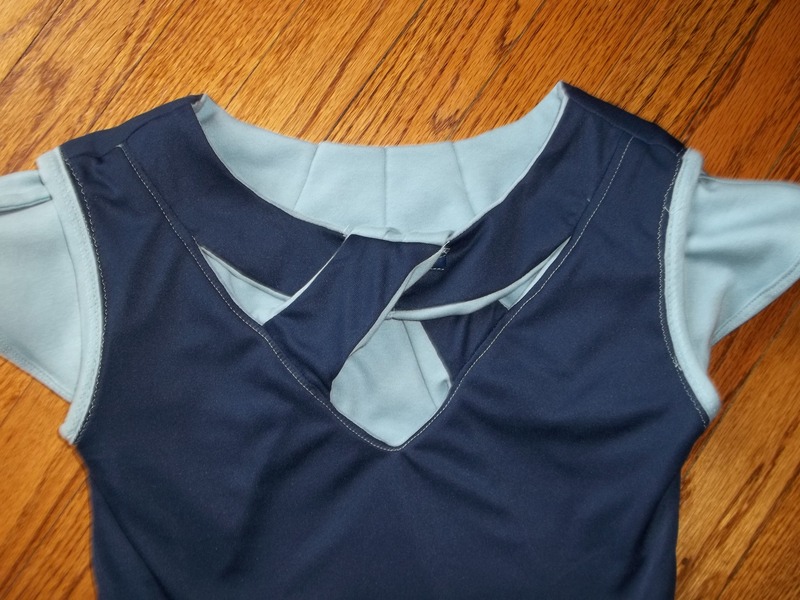 Firstly, where the twist flips over the round neckband right at the bottom of the throat, I covered the raw edges of the two twist sections with matching navy bias tape. This way I could sew the ends of the bias tape to the back of the neck band without worrying about any raw edges fraying or showing or not laying down flat. It might be hard to figure out what I’m saying here, but if you make this top, you’ll understand. Also, in lieu of armhole facings, I made my own self-fabric bias bands to neatly cover the raw armhole seams. Finally, my only other change to the pattern is merely a fitting fix. After my top was done, it gaped a bit along the back of my neck, so I sewed three darts along the edge, in a decorative 30s “fan” shape to make them look more decorative than functional. 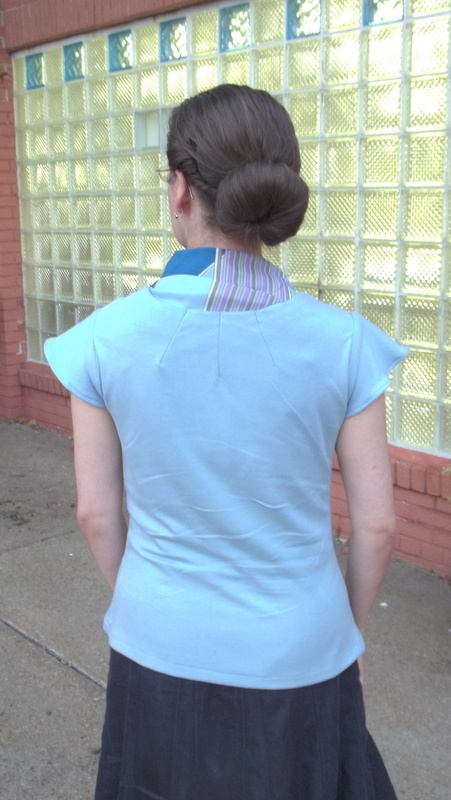 Many other reviews from ladies who have also made this top also had some gaping, like myself, along the back neck edge, but I like my dart decoration solution better than if I had fixed this problem earlier on the pattern. One more point that I like on my twisted neck top is the lack of top stitching. However, I sewed in plenty of edge stitching on the wrong (the lining) side, and this does its job well enough with a touch up of light ironing. As I did for my “Water for Elephants” imitation dress and my 1935 Vintage Vogue #2859, the elimination of top stitching has a wonderful classy appearance for the neckline, which is the center of focus. Contrast top stitching would, I think, look extremely good on the neckline if this top was made in a fun, modern print…maybe I’ll have to try this combo sometime. The best part about sewing is top is the challenge which it provided me. Now that I have done so much sewing, it is becoming slightly difficult to find something that really tries my sewing skills in a good way. Exercising one’s sewing abilities does feel good! The deep V of the inner neckline is a bit close to being low-cut on my chest, but not bad enough to stop me from wearing my new top. 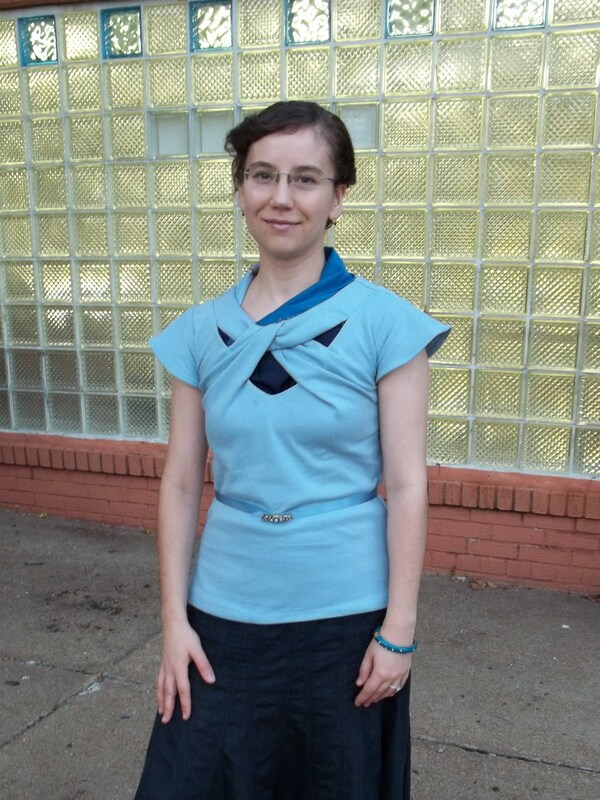 Besides, my creative juices have figured out the perfect fix if I want the neckline to be a bit more covered up. A vintage silk scarf of mine looks great tucked under the neckline (see picture). I have also found that my navy tank top underneath creates a neat presentation, with the added bonus of keeping me warmer when I want to wear my twist neck top on cooler days. Unfortunately this top might not get much wear this year, as the cooler temps are moving in quickly and summer is quite gone. Boo hoo! Even though I often get eaten alive by mosquitoes or sweat like a horse in our town’s stuffy humidity, I am always sad to see summer leave – it’s just me. I am a warm weather girl, and posting about my twist neck top kind of reminded me of this fact. As enjoyable as fall can be, I always get the summertime blues. Dressing in layers just to stay warm…yuck! No wonder I love to listen to Lana Del Rey’s new song, “Summertime Sadness”. Worn now or next year, I now have a neat top that’s as casual as a tee, but dressier, with some great 1930’s details. P.S. Gracie Burns (yes, from the Burns and Allen TV show) did a very humorous skit about “leftovers”. Blanche, her neighbor, asked Gracie if she needed anything since she was making a trip to the grocery store. Gracie wanted a few basic items along with asking for “leftovers”, saying that so many recipes call for them but the butchers never seem to know about those kinds of cuts. Quirky, I know, but it’s so much funnier watching this for yourself. I couldn’t help but think of this. Burns and Allen know how to make me laugh and smile! News Flash! Hooray, Hooray, I’m a Winner! Today I just received the wonderful news that I am the 1st place Grand Prize winner to the “Butterick to the Big Screen” sewing contest, run in honor of their 150th Anniversary. Talk about being ‘jump up and down scream like crazy’ happy! My version of Doris Day’s striped collared blouse from the “Romance on the High Seas” movie (1948) was the entry that won. You can view the blog post for my blouse here. I am honored to be chosen as the winner and would like to thank Butterick and Mood Fabrics. I would also like to thank Doris Day for the Hollywood inspiration for my project. The Butterick Facebook page showcasing all the top winners of the contest can be seen here. All the other winners made some amazing creations, as well. The page for the contest itself can be found here.